Breakfast took place as usual in the Mauretania Restaurant. However, the cutlery was all odds and ends. I had a fish knife, a salad fork and a soup spoon rather than a regular knife, fork and spoon. It seems that the ship was running out of fresh water and so the cutlery could not be washed. She had not taken on any fresh water when she was anchored off Martha's Vineyard and now with fuel around her, she could not use her own facilities to turn sea water into fresh water. A number of the usual sea day activities were scheduled for the morning. The idea was to entertain the passengers so that they would not worry or become bored. Since it was now obvious that we were not be leaving the ship this morning, I wanted to change from the suit I had worn to the Wardroom party into something more comfortable. The only problem was that the passengers' luggage had been collected the night before in anticipation of disembarking in New York in the morning. I therefore went on a search for my bags. It did not take me long to find the baggage. I had a cabin on Two Deck and outside of the Computer Learning Centre on that deck, I found a vast mountain of bags that reached the ceiling and stretched from one side of the ship to the other. I climbed onto the mountain and began mining for my bags. Luckily, they were not buried very deeply. So I took them to the cabin and changed. Later, I met one of the officers who told me that the luggage was a matter of some controversy between Cunard and the authorities. It had been decided that the passengers would have to be disembarked today because the ship was running out of fresh water. The authorities, however, wanted the passengers to carry their bags with them so that they could be inspected by customs officials. Cunard was saying that this was impractical given the age of many of the passengers and the number of bags per passenger. Indeed, considering the mountain of bags that I had seen earlier, it would have required a small freighter just to take the luggage to the shore. Apparently, this argument was resolved in Cunard's favor. After lunch, an announcement was made that the passengers would be disembarked without their luggage. The bags would be shipped to the passengers' homes. Disembarkation would take place by deck. Those passengers with cabins on Boat Deck, One Deck and Two Deck were to assemble in the Grand Lounge. Further instructions would follow. While we were waiting in the Grand Lounge, the crew set up a table that ran the length of the dance floor. On it they placed all sorts of food items like at the ship's Midnight Buffets. Although lunch had just concluded, the passengers descended upon this table like locusts and the table was picked clean in a matter of minutes. We were escorted downstairs to a tender platform on the port side of the ship. Waiting for us there was a large ferryboat with multiple decks. Over 500 passengers were taken off. The officers and crew members that I spoke to before leaving were confident that the ship would be back in service shortly. However, as we pulled away from QE2 in the ferry, quite a few wondered whether this was the end for the last of the great liners. In those days, QE2 was running for her life. Everyone else had given up on the Atlantic service and it was always questionable how long QE2 could survive financially. Now, despite the brave talk, it was clear that the ship was badly damaged. Her owner at that time was an engineering conglomerate, Trafalgar House, which had bought Cunard at a time when it was thinking of branching out into the leisure industry. It was now involved in a takeover battle. Would it be willing to invest more capital to repair a 23 year old ship? As QE2 disappeared over the horizon, the captain of the ferry announced that the food in the ferry's snack bar was free. Once again, the locusts swarmed and descended upon the snack bar. Our destination was Newport. We landed at the same pier that QE2's tenders used during port calls in this resort town. Nearby, was a parking lot full of luxury buses, which we boarded. The buses took us to Providence, Rhode Island. Cunard had rented several Amtrak trains to take the passengers to New York. Once the train I was on left the station, the conductor announced that the food in the dining car at the front of the train was free. A line formed that ran down the length of the train. Above: Passengers being evacuated onto a ferryboat. Above: The ferry pulls away from the wounded ship. 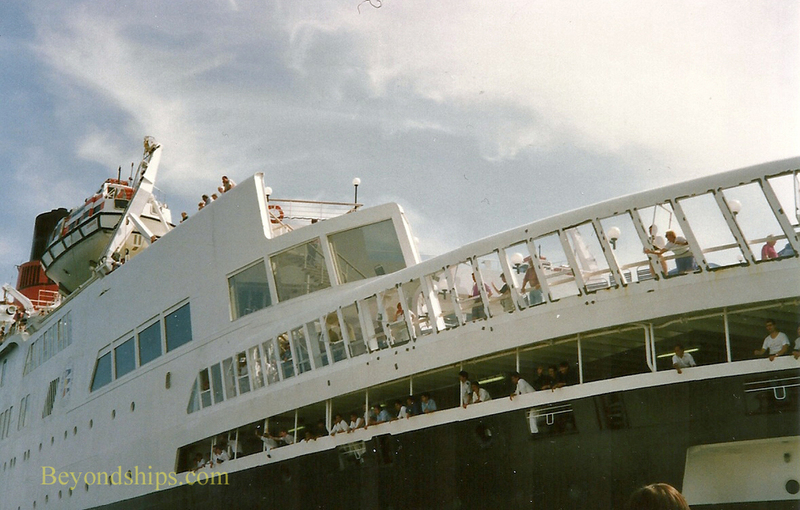 Below: Passengers, including author Tom Clancy (in cap), catch a last look as QE2 fades out of sight. 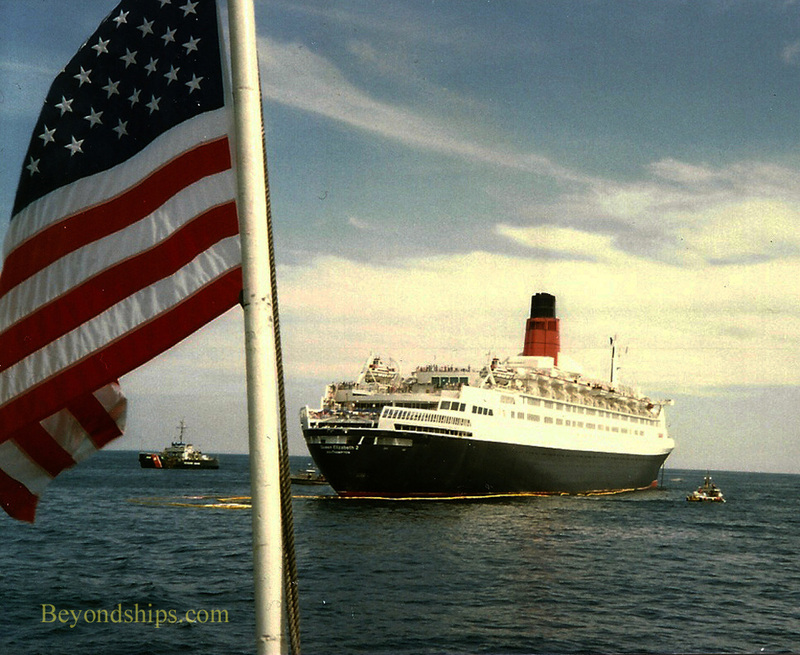 After disembarking her passengers QE2 proceeded at a slow speed around Cape Cod accompanied by a Coast Guard cutter and two tugboats. It had been determined that the nearest dry dock capable of handling a ship of her size was in Boston. Fortunately for QE2, this dry dock which had not been used since 1985 had just been refurbished for use by the U.S. Navy. 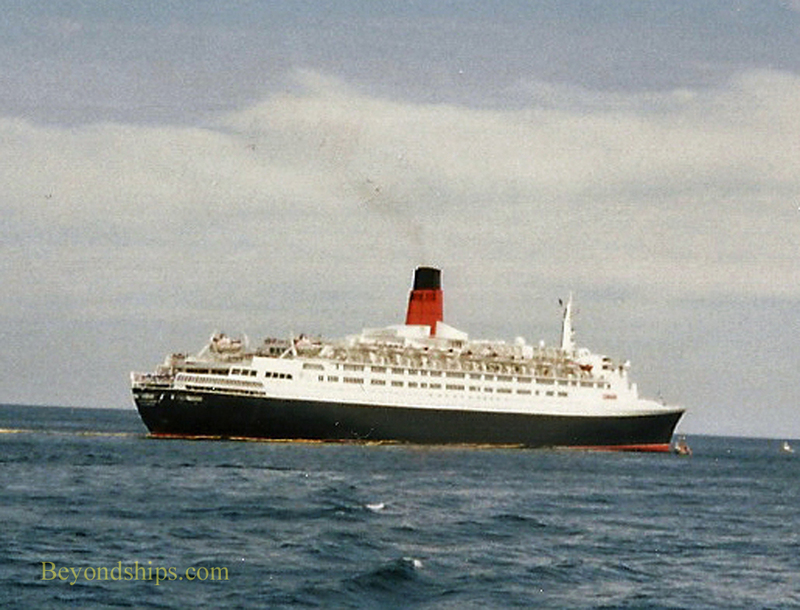 QE2's accident was a blessing for the shipyard, General Ship Corporation of Boston. Workers who had been laid off were rehired. 200 workers were involved in the project including a retiree who was the only one who knew how to operate this World War I era dry dock's hydraulic pumps. 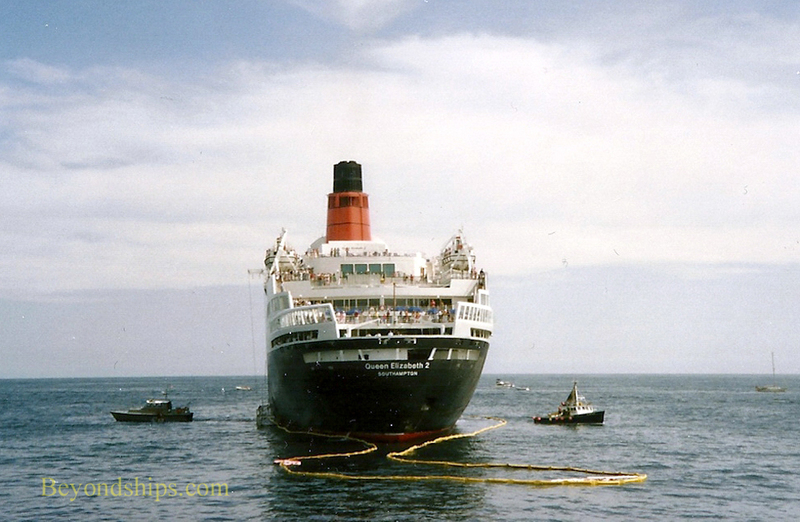 Once in the dry dock, it was found that QE2 had been damaged to a much greater extent than anyone had realized. A 300 foot section of the hull was affected. There were gashes up to 74 feet long and three inches wide. The keel was dented, four double bottomed tanks had been ripped open and 20 had been damaged. The shipyard made temporary repairs, welding on steel plates and patching the holes. Cunard solicited bids from shipyards to do the repair work. The winning bid was made by Blohm & Voss of Hamburg, Germany. Of course, this meant that the ship would have to cross the Atlantic. However, I was later told by one of the officers, that with her temporary repairs, QE2 could not get certified as a passenger ship. Therefore, she made the crossing certified as a cargo ship. Upon reaching Germany, QE2's fortunes took a turn for the better. The shipyard repaired QE2 quickly and efficiently. By 4 October, the work was done and the ship went back into service. Her next crossing was one of her fastest due to the fact that her hull had been scraped cleaned and the water flow over the hull was unencumbered by sea growth. As for the financial consequences, reportedly, the damage to the ship was $20 million. Eleven transatlantic crossings and cruises had to be cancelled. But I have been told that Cunard had an excellent insurance policy which covered the repairs as well as the profits that the ship would have made from the nine crossings and two cruises that had to be canceled as a result of the accident. Of course, there were also years of litigation.